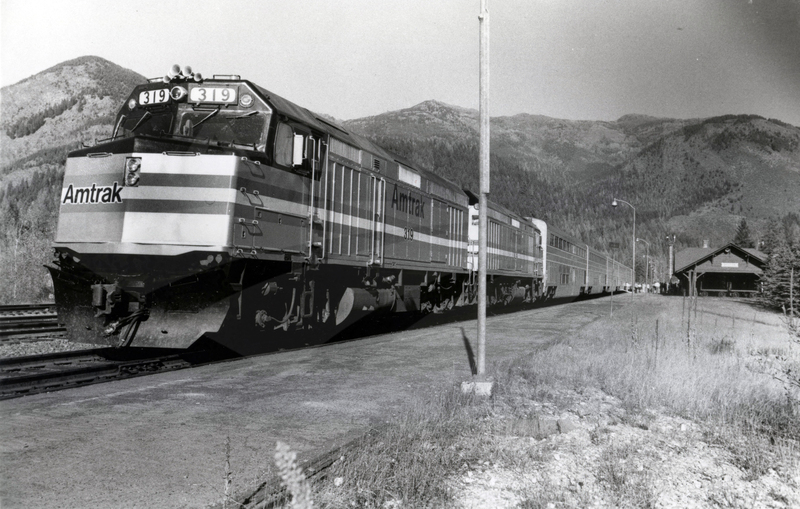 Home > Archives > Empire Builder at West Glacier, 1980s. Empire Builder at West Glacier, 1980s. Black and white photograph showing the Empire Builder (Chicago-Seattle) stopped at the West Glacier, Mont. station; image probably dates to the early 1980s. The Empire Builder was the first train to feature full bi-level Superliner service, with inaugural trains making their debut at the end of October 1979. To mark the occasion, “Champagne was offered to adult passengers…and buttons and other souvenirs were distributed.” Earlier in the month, promotional trains with Superliner coaches, a Dining car and a Sleeping car had covered the entire route between Chicago and Seattle, stopping at each Amtrak-served community to show off the new face of long-distance train travel. Visitors could tour the cars and learn about accommodations. In this image, the train is led by F40PH diesel-electric locomotive No. 319, which wears the Phase III paint scheme introduced in 1979. The stop at West Glacier was originally called Belton. The current depot was built by the Great Northern Railway between 1906 and 1910, and expanded in 1935, to accommodate the growing number of tourists who took the train to visit Glacier National Park. Rough-hewn siding extends over the entire structure and gives it a rustic appearance that blends well with other buildings in the park.